Join local clothing and textile collector Vicki Racey for a fun, funky shopping experience! 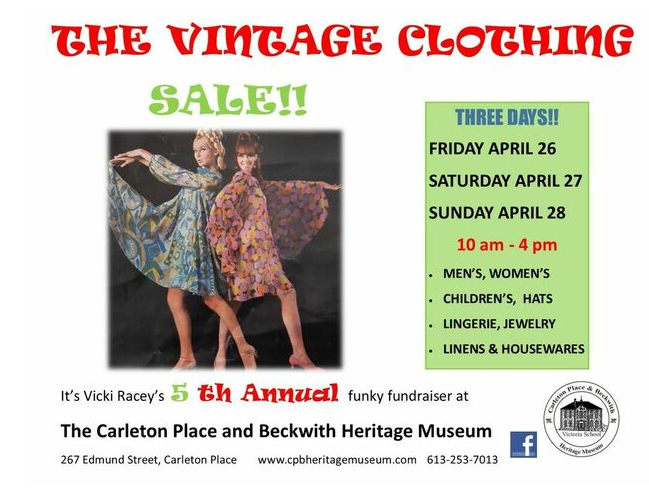 As always, there will be lots of men’s, women’s and children’s vintage clothing to choose from, as well as hats, lingerie, accessories, and jewelry! If you’ve been before, you know you are in for a treat! If you’ve never been – DON’T MISS THIS EVENT!!! NOTE: sunrise – 6:24 a.m.
Municipal and Community Information from Beckwith Township. Barry Martin performs at the Army Navy Airforce Club in Carleton Place. Open to everyone. Have fun singing to the tunes. “Over the past few years I’ve performed as a solo artist, playing cover songs and writing more original material. When I’m asked what type of music I play, I’ll always say “everything from George Strait to Pink Floyd”. I grew up in a family surrounded by musicians, I have to admit how blessed I am for being able to share what was handed down to me from my Father. His white Kalamazoo Electric Guitar for starters. I knew I’d be playing that beauty very soon. I was so young when I first held that guitar of his. I remember my father telling me how my fingers were still too short to play. I knew the day would come when I could play that guitar as my own. ON STAGE !! I don’t ever remember being shy, I liked being the center of attention. I inherited that from my Mother’s side of the family. I could write a book on some of the characters on my Mother’s side of the family. The one memory that stands out the most is the family gatherings. Cousin’s, Great Aunts, and Uncles would all show up with instruments in hand. They would play for hours. And the singing they would do, just amazed me. That was all the motivation I needed to keep on playing… All through my early teenage years of growing up, I was an accomplished Cello player. Later teenage years, my guitar went where I went. To this day, that hasn’t changed and never will I hope”. Barry Martin. We are getting ready to host our 7th annual fundraising Heritage Dinner! 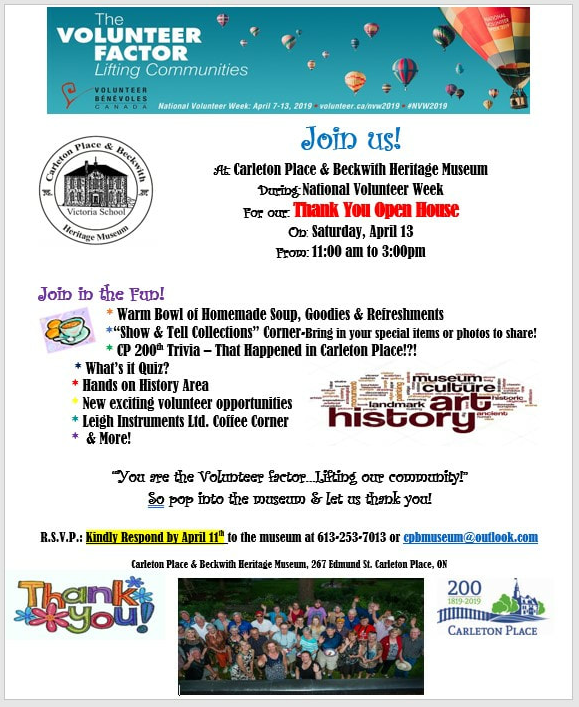 To kick off the Carleton Place 200th celebrations in style we are presenting “In Rhythm with Our Roots”. It’s a night to gather together for a meal, have fun, and celebrate our history!Our Master of Ceremonies Linda Seccaspina, together with members of the Mississippi Mudds, will guide us on a musical journey through time as we recall local historic events as seen from the Mississippi River’s point of view! 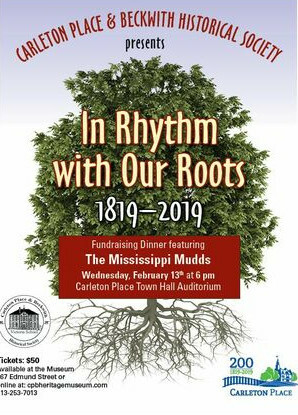 That river has seen a lot in 200 years!“In Rhythm with Our Roots” takes place Wednesday, February 13, 2019 at the historic Carleton Place Town Hall Auditorium. Doors open at 5:30 with cocktails from 6 to 7, followed by a Roast Beef buffet dinner prepared by Leatherworks Catering. Along with historical displays there will be a silent auction featuring fabulous Valentine themed items. 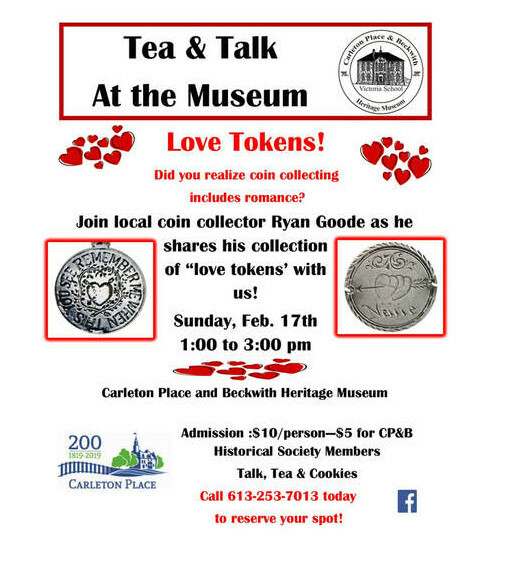 This is a great opportunity to get your sweetheart something unique! Look for door prizes too!This annual event is our major fundraiser of the year, and raises much needed funds to continue the work we do collecting, safeguarding and sharing our local history. 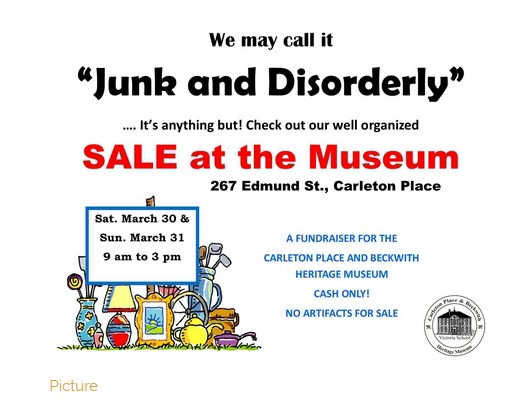 All funds raised will assist in the Society’s operation of the Carleton Place and Beckwith Heritage Museum. Since 1988 the Museum has been the town’s main trustee of local history. As a non-profit organization, we rely on the community’s generous support to maintain our work, especially as we embark on our community’s historical milestone 200th year. Tickets are $50 per person and may be purchased by cash at the Museum or by etransfer to cpbmuseum@outlook.com. Tax receipts will be issued and available for pickup at the door. 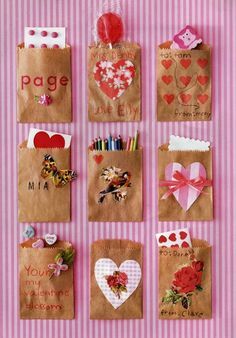 Join us for a fun heart-themed craft drop in. This is for all ages, and we’ll have crafts, a special I Spy, and maybe even a game. No registration is necessary! Parents, please plan on staying with your children. They activities might take your child a few minutes or the entire hour…and supervision will be limited. Please call us at 257-2702 for more information. Ron McMunn started the “Heart Jam” over 25 years ago to raise funds for the University of Ottawa Heart Institute. The jam has always been held each year on the first Sunday in February during “Heart Month”. It was with great sadness that Ron’s son, Jeff, died from a heart condition in late 2016. As such, the event is now being referred to as the “Ron & Jeff McMunn Heart Jam”. Again this year, the event is being promoted as an audience participation event, not a concert. People are encouraged to get up and dance throughout the day. Tickets for this year’s Ron & Jeff McMunn Heart Jam are available at the locations listed on the poster. Get yours early as this event always sells out. All proceeds go towards the University of Ottawa Heart Institute.